National Council of Hotel Management and Catering Technology Joint Entrance Exam, which is also commonly called as NCHM JEE, is jointly conducted by National Council of Hotel Management and Catering Technology and Indira Gandhi National Open University. As you must be aware of, the national level hotel management entrance examination NCHM JEE 2014 is scheduled to be held on April 26, 2014, Careers360 brings you the NCHM 2013 ranker tips regarding preparation strategy of the coveted exam for Hotel Management. In today’s article of the Topper Interview series, Careers360 shares success story of Devashish Pathak, who secured 821st rank in NCHM JEE 2013. In this interview Devashish Pathak, who is pursuing undergraduate program in Hospitality and Tourism in the renowned Institute of Hotel Management, Hyderabad, shares the strategy regarding how he managed to crack the entrance examination and how his reading habit helped him to perform well in the written test. Careers360: What were the factors which motivated you to choose a career in hotel management sector? Devashish Pathak: I decided to pursue undergraduate hotel management course because hospitality sector is a fast growing industry. The profession will further provide me an opportunity to work at exciting locations. Careers360: Which other hotel management entrance exams did you take? How was your performance in those? Devashish Pathak: I appeared only for NCHM JEE 2013. Careers360: List a few hotel management entrance exams which should not be missed by hotel management aspirants. Share some light on them. Devashish Pathak: Apart from NCHM JEE, I will propose two other hotel management entrance exams for the hotel management 2014 aspirants. One, IHM-Aurangabad and second hotel management competitive exam conducted by Oberoi Centre of Learning & Development. Careers360: Did you aim at any particular hotel management institute? Devashish Pathak: No, I did not target any specific hotel management institute to get myself enrolled with. My goal was to perform well in the written test so that I can secure admission in a reputed college. Careers360: What was your initial preparation strategy which you followed about 1 year prior to the exam? How did it change after 6 months and 3 months before the exam? Devashish Pathak: I used to watch informative television shows to stay updated with current affairs. Afterwards, Google searched the topics which I heard on the television or read somewhere at some time to gain in-depth information about it. My curiosity to explore topics in terms of its subject matter developed and boosted my reading habit. This in turn polished my flair on general knowledge. Devashish Pathak: For aspirants not enrolled at coaching classes, it is not a problem. 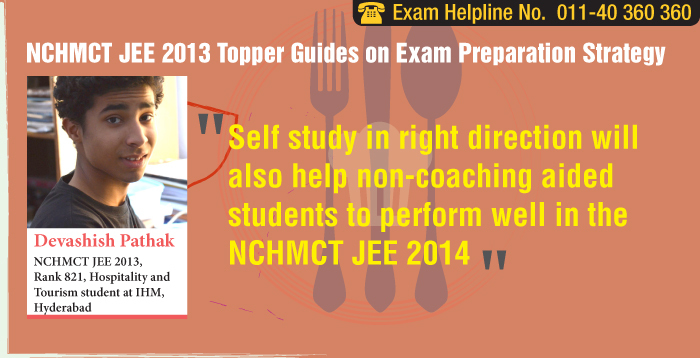 Self study in right direction will also help non-coaching aided students to perform well in the NCHM JEE 2014. The aspirants need to practice and solve mathematical questions of 8th standard. Syllabus of intermediate examination for subjects- English and elementary science should be thoroughly revised. Current affairs should also be equally focused by 2014 aspirants. Aspirants are not enrolled at any coaching institutes for them a proper guidance is very essential for the entrance exam. Careers360: What was your time management strategy during the exam day? How did you mange it among the different sections of the paper? Devashish Pathak: First I attempted all the questions on which I was confident. Then for questions on which I was less confident I followed an answer-deriving technique. It was like this- eliminate the less convincing options & square out the answer with the most probability and for the questions on which I was clueless were not attempted by me. Careers360: Do you believe securing admission in a top and reputed hotel management makes any difference to your career prospects? Devashish Pathak: Yes, I believe that pursuing a course from IHM Hyderabad will accentuate my career prospects. The teaching and course module adopted by the institute is in sync with requirement of hotel industry. From day one of joining IHM Hyderabad I was made to learn the etiquettes of the industry. Careers360: Please share some tips with the NCHM JEE aspirants. Devashish Pathak: To strengthen knowledge of current affairs, aspirants should read or watch at least ten news stories per day. Students should read newspaper on daily basis. Frequent practice exercise on simple mathematical calculations will improve question solving speed of students. Fundamentals of physics, chemistry, and biology should be well revised. I also used to practice in this way only. Demand for hospitality graduates on rise! Stay tuned to hospitality.careers360.com for more news and feature articles on Hospitality and Tourism exams.